/// How to create a simple document with ordered and unordered lists. // Create new ordered list style. // Add the collection of paragraphs marked as ordered list. // Add the collection of paragraphs marked as unordered list (bullets). // Save our document into PDF format.
''' 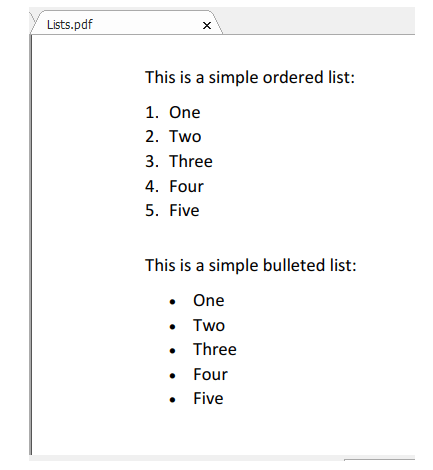 How to create a simple document with ordered and unordered lists. Dim documentPath As String = "Lists.pdf"
' Create new ordered list style.
' Add the collection of paragraphs marked as ordered list.
' Add the collection of paragraphs marked as unordered list (bullets).
' Save our document into PDF format.